I had originally intended to include this list in my race report, but it was becoming so long, I decided to split this out into a separate post. 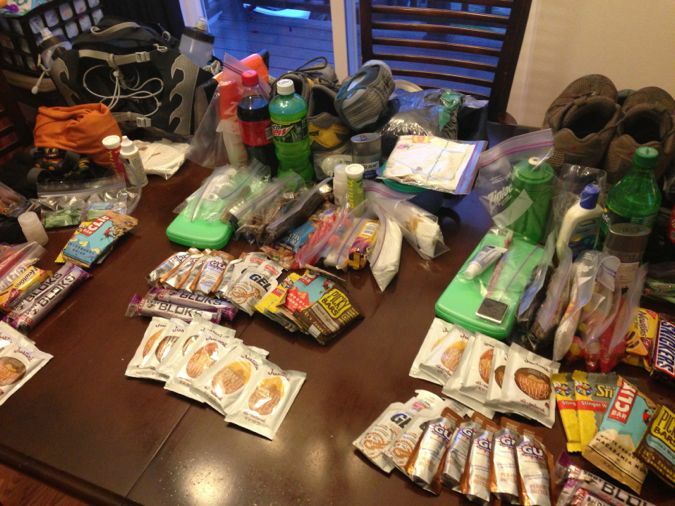 On any 100 mile race, your choice of gear is important. For a race like Resurrection Pass that is almost entirely self-supported, it’s crucial. I consider myself extremely lucky in that I had very few problems during my first 100 miler, and I attribute that in large part to my choice of gear and nutrition/hydration. I had no major chafing or blistering issues, and aside from the general soreness and tiredness that you would expect during a 100 miler, my body held up very well. I was especially happy to have no issues with back pain, which is something that’s caused me trouble in the past. I also really didn’t experience any major lows the entire race. I worked hard to really stay on top of my nutrition and hydration, and it definitely paid off. For probably 25 miles, from mile 55-80, I actually felt really good, and was moving well enough to pass 2 people relatively late in the race. Osprey Talon 8 waistpack – I took a bit of a risk and bought this only about 2 weeks out from the race. It ended up working out great, and I’m glad I used it. Carries 2 bottles, with plenty of storage space for the rest of my gear and food that I needed to carry on the trail. Took a little time to adjust and find the “sweet spot” in terms of tightness and where exactly on my hips/waist to wear it. 2 20oz CamelBak Podium bottles – of all the bottles I’ve collected over the past few years of running, these are by far my favorite. I’ve never had a problem with them leaking, and they are very easy to drink from. Patagonia Houdini jacket – super lightweight and versatile jacket. It’s not completely waterproof, so it may not do well in an all-out downpour. Also works well as a wind breaker. Garmin 310xt – lasted about 17 1/2 hours of the advertised 20. Fenix HL30 headlamp – multiple brightness settings, up to 200 lumen. I didn’t have it at full brightness, but still had to change batteries once to get through the night. Altra Lone Peak 1.5 – my shoes of choice for running on trails. Their overall comfy design (especially the wide toe box) kept my feet happy for 100 miles. I wore the same pair for the entire race. Injinji socks – when combined with Altra shoes, these socks make my feet nearly bulletproof. During this 100 miler, my feet were wet for pretty much 25 hours straight, and I only ended up with a few very small blisters on the outsides of my big toes. Bodyglide – essential for preventing chafing. I lubed up well before the race, and reapplied in a few strategic locations at mile 70. Justin’s nut butter packets (various flavors) – these were my “bread and butter” fueling source. They go down easy and aren’t sickeningly sweet like most gels. Plus, they’re very calorically dense, with just under 200 calories per packet. Peanut Butter GU – this is pretty much the only flavor of gel that I can stomach anymore, though I think I only ate 2 the whole race. Jelly beans, Swedish Fish & peanut butter M&M’s – some nice treats to look forward to in my drop bags. I packed them into those small “snack size” Ziplock bags, so that I had a little bit of a bunch of different things, depending on what sounded good at the time. Peanut butter & honey sandwiches – I had one of these for each of the 3 sections of the race between aid stations. Bacon – I’m guessing the combination of salt and grease is what makes this so appealing later in the race. I had a few slices in each of my drop bags. Salt & vinegar chips – again, salt + grease = yum during an ultra. Also, supposedly vinegar helps with cramps, though that wasn’t a problem for me that day. Snickers & Payday bars – another quick pick-me-up with the sugar and salt. I think I had one of each. Coke – sugar + caffeine + carbonation fizz. I had a bottle in each of my drop bags, but didn’t drink more than a few swigs of each. Tailwind – a great alternative to the typical sports drinks. Much more of a “savory” than sweet taste. Unlike Gatorade and the like, I could drink this stuff all day without getting sick of it. The way I mix it, it comes in at 250 calories per bottle, and is actually meant to be used as your sole fuel source during long endurance events. I knew that carrying it to refill bottles out on the trail was going to be difficult, so for this race I was just using it to supplement my other fuel. I started the race with Tailwind in both bottles, and refilled at the aid stations from my drop bags. Nuun electrolyte tablets – I don’t like these anywhere near as much as Tailwind, but they were much easier for refilling at river crossings. MSR Sweetwater purification drops – add 4 drops per bottle & wait 5 minutes before drinking – easy! Nice write up. I always enjoy reading other’s perspectives of the same event. I’ve been putting off writing mine, as I dropped, but I should still get it out there. Great job and good running with you at Equinox!